So during this last quarter I think I’ve been pretty busy all things considered. Between Saber Guild appearances, EMC shoots, training, and music I’d say this has been a pretty good year! So instead of bombarding your feed with 37 catch up posts I think I’ll just go for the SuperMegaPOST (patent pending) and hit you with all kinds of goodness right NOW!! Saber Guild appearances and shows went great this past few months. I’m actually starting to get recognized as Quinlan Vos now and every time my wife hits a show she gets bombarded with pic requests! We had a great time at Nuke the Fridge Con, Long Beach Comic Con, and of course a legendary Make a Wish Foundation event. The Make a Wish event was one of the greatest things I’ve ever had the privilege and honor to be a part of. Benton is a young boy who wished to become a Jedi Knight and defeat Darth Vader. Together with the 501st and the Rebel Legion we were able to make his wish come true in a full day of Jedi training and a SECOND day of battle in which he accomplished his wish and defeated Darth Vader himself. This was GREAT fun to be a part of but I also got the chance to work with some REALLY cool people from one of my FAVORITE WEB SERIES’ EVER!!! I hope to make 2014 just as productive and hopefully up the intensity even more!! I plan on new music more videos and more Jedi appearances so hope to see you all there!! Star Wars vs. Star Trek…. As if That Was a Battle…. The EMC Monkeys have put together for your viewing pleasure a wonderful Star Wars/Star Trek mashup video. Check it out! Ever wonder how a phaser holds up against a lightsaber? What would Spock use against a Force-Wielder? Could Captain Kirk monologue a Sith to death using boredom? How many Sith does it take to destroy an Enterprise? The answers to some of these questions and more are in this video!! What the hell is a Harlem Shake? Even Jar Jar showed up. So who can you find in there? So how did everyone like ReactorCon? Hey ma look it’s me! It was AWESOME! I showed up with the EMC Monkeys to do a little halftime show for their cosplay contest. We had a great time!! I got to see Joe Romersa perform some Silent Hill songs, a well deserved Link win the cosplay contest, and hang with the Saber Guild!! Our show was the usual EMC beatdown and the audience LOVED IT!! I hope we get invited next year to return because we had a blast! Here’s a few little snaps! That is a nice shield! 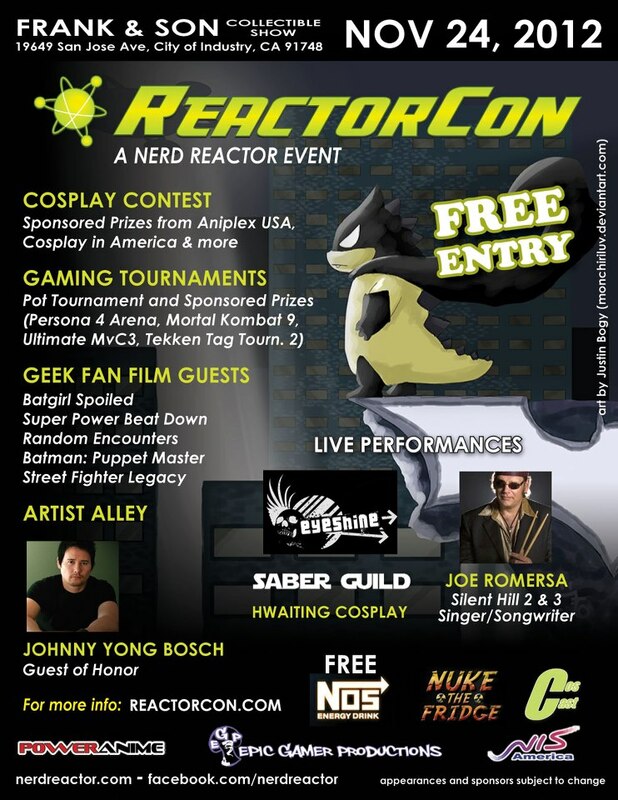 Come see The Urban Ninja and the EMC Monkeys at ReactorCon!! Wanna come to a FREE one-day convention in SoCal? 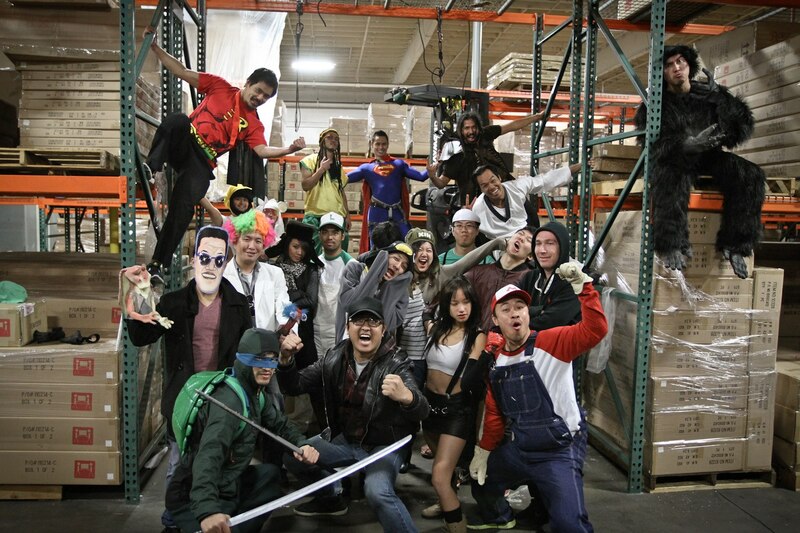 November 24th, 2012 at Frank and Son at 19649 San Jose Ave, City of Industry, CA 91748. This is a free event filled with all kinds of awesomeness such as special guests, gaming tournaments, cosplay contests, fan film booths, and concerts. 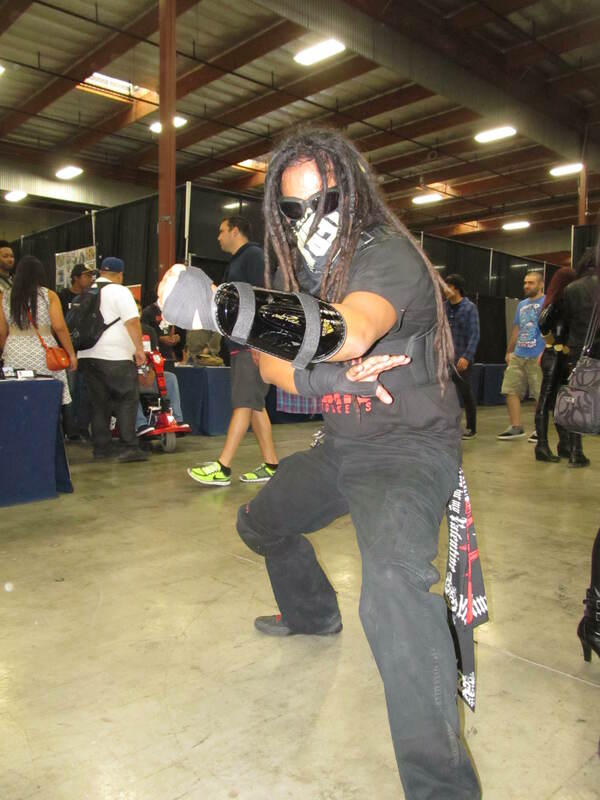 This is the first NerdReactor convention who is great for fans of video games, comics, anime, and cosplay. If that’s not enough to get you there then guess what? The EMC Monkeys (and I)will be doing a live performance! Be sure to check out our performance between 2-3pm! We’ll also have a booth so come on down and get some shirts, patches, and stickers! (Don’t Forget to Like the Facebook Page and follow us on Twitter…… anybody use Google+? Want to see Ninja skills in action? Want to see some badass Mandalorians? What about hot cosplay girls? Wanna meet Sid Haig? Go like the Facebook page!! Fight Coordinator: Ok, I’m going to have you do do some really close quarters combat fighting. Very fast and direct. Director: Great, I’ll tell the Camera Operator to prepare for his seizure. Damon: So what do you want me to do? 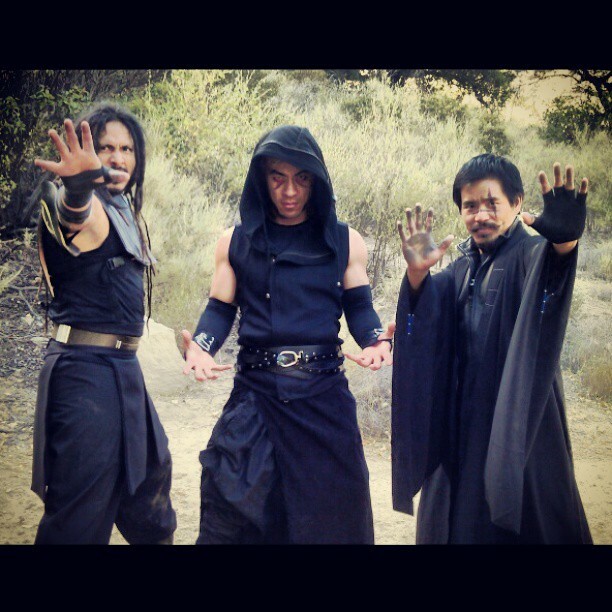 Fight Coordinator: Oh it’s really easy, just stay close to these stunt men, flail around aimlessly, make some fighting grunts and they’ll take care of the rest. Director: Ok are we ready to roll on this? Camera Operator: 49… 50. Ok. Uh…. whoa…. Rolling! Well, instead of the usual EMC fighting prowess this week the monkeys decided to take a page from Hollywood and try their hand at an American (chuckle) fight scene. There’s no way not to enjoy this because whether the fight works or doesn’t work, it still works. Is this Hollywood enough for you? They do it monkey style. 1. Badass Ray Harryhausen monsters. 2. The OG King Kong. 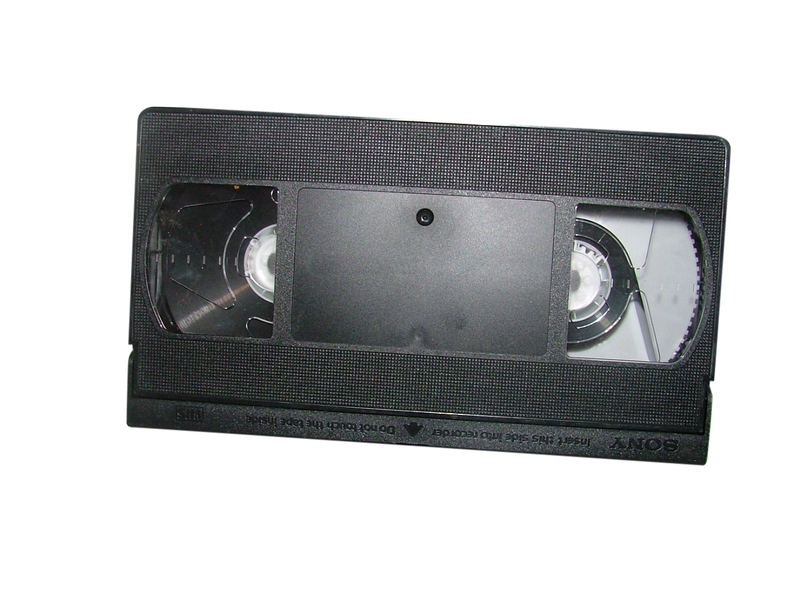 But if you don’t know what a VHS is you might not be familiar with the ancient art of stop motion. Learn well young ones. Stop motion can be a thing of beauty… or hilarity. What’s your favorite stop motion moment? The Oatmeal Man is Coming: 26 DAYS REMAIN….